Grace Q & A: Is the Message of Grace a false gospel or false teaching? We've begun a new study getting back to the basics of the Good News of Grace. We've seen that in Christ there is no condemnation. We've seen what cheap grace really is. We've answered the question what about too much Grace. Today, I sense the strong leading to once again address the objection that Hyper-Grace or Radical Grace is merely a false, end time deception, leading multitudes astray. I have addressed this objection, here, here and here. Just to list a few. It may seem I am belaboring a point but the truth is many are still charging Hyper-Grace as some end time error or falsehood. Also, if you follow the Gospels, Jesus often says to His disciples, the Apostles, "Again, I say to you." It seems He had to repeat things as well, thank God He is patient with all of us as we are all still learning. Is the Radical Grace of God, in fact, a false gospel? Are we who proclaim Grace leading you astray? What does God's Word, the final authority, the source of truth say on this subject? In previous posts, I have laid out evidence that Grace is not an end time deception but rather an end time awakening. A Grace awakening. When the status quo is questioned, it certainly stands to reason many will get upset and won't like their way of doing and thinking challenged. Let's recap the truths that prove Grace is not an end time deception. First, let's detail once again what the Bible refers to specifically as deception and false teaching. I don't see Radical Grace in that list. Radical Grace doesn't deny Jesus became a man. Doesn't deny Jesus was God manifest in flesh. Radical Grace doesn't deny the Bible is God's Word, inerrant. Grace would not follow a human claiming to be Christ. Grace surely would never deny the resurrection of Christ. Grace doesn't alter the Gospel, it reveals it. We've also seen that some resist Grace because of wrong thinking. Some leaders feel the need to "control" their congregation. They feel strongly if they don't mix a little condemnation, fear, insecurity in their message the people will cast off restraint and pursue every lustful imagination that comes their way. Others resist because they have a poor image of God. He isn't their Father, He is their employer. Why are we here? Oh, we are here to serve our master. We are here to obey His rules. Didn't you know, angels are His servants? He already had angels. If He just wanted servants, knowing He already had them in angels, why create man? Why go through all that trouble of the fall, the Cross, and the resurrection? They can't grasp that God wasn't looking for subjects but rather sons and daughters. God was looking for a family. Still, others look at their accomplishments and achievements. They cling to their spiritual disciplines that they perceive brought them success. Perhaps some have seen a level of measured success by following strict spiritual disciplines. What is the real cost though? Their drive may have left many others by the wayside in burnout and being worn out trying to perform perfectly. What I have seen over an extended time of study and research is at the root of the objection to Hyper-Grace is two major issues. These don't deny the issues I have just raised but better highlights the main objections tradition clings to. The first real root issue many of those who object to Radical Grace is their aversion towards the eternal security of the believer. This abhorrence towards the truth that once the believer is saved, he is always saved compels them to reject Grace. It leads them to conclude that Radical Grace is in fact deception. The idea of our future sins being forgiven and our salvation unconditionally eternally secure is false teaching in their minds. Does the Bible affirm our eternal security? Does the Word confirm our future sins forgiven? Yes, absolutely. What about our eternally secure position in Christ? John 10 clearly proves our eternal salvation in Christ. When we receive Christ, we are not on probation. He hasn't rented a room in Heaven for us until we persevere till the end and then transitions it to ownership for us. Repentance, confession, and broken fellowship. There is another group of believers who are still seeing through the eyes of tradition. They do affirm our eternal security in Christ. Their objections are that Radical Grace teaches against repentance, the confession of sins and broken fellowship as the result of a Christian's sin. In a nutshell, they're upset because they feel Radical Grace tells people not to tell God "I'm sorry" when they sin. I will readily admit that perhaps we can better convey the message when we speak of repentance and confession of sin. That said it doesn't alter the truth that we have been forgiven once for all. What they fail to grasp is that we don't confess in order to be forgiven. We can acknowledge our sin because we are already forgiven. They don't see that. They in a sense define repentance and confession as an apology. But that's not even the definition of repentance or confession. To confess is to say the same thing. Repentance means to change one's mind. As believers, we are eternally forgiven. When we realize we missed it, we can come to God an acknowledge that attitude or action wasn't rooted in love and agree with God about it. What are we agreeing to? That the action was a sin that God has already forgiven, and that we are still the righteousness of God in Him. As for broken fellowship, tradition sees our future sins as some kind of judicial forgiveness but we must still confess our sin to experience a "familial" forgiveness. This is a serious error. God is a loving Father. He isn't breaking fellowship over our actions. Also, God isn't into religious double talk. You're forgiven but not really. In Christ, we are forever forgiven, and He already declared He would never leave or forsake us. The Radical Grace of God is not a new trend. 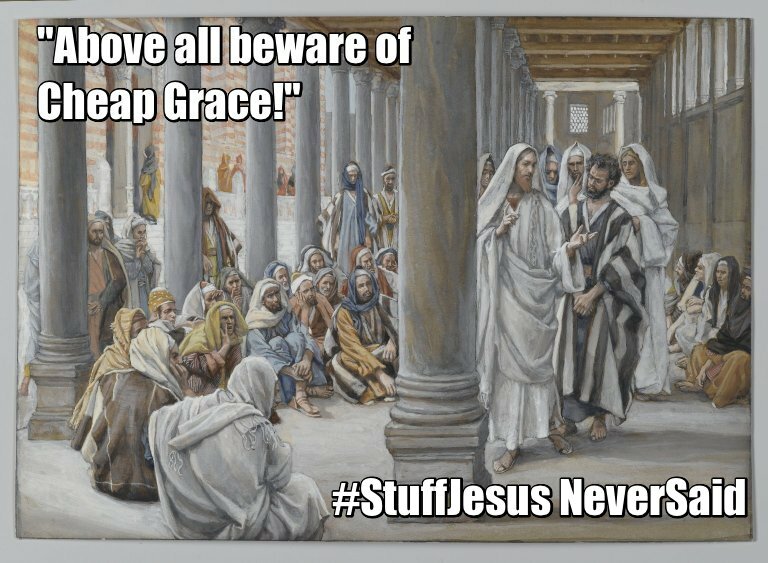 Hyper-Grace is not some new fad sweeping through the Church. Grace isn't something we instituted to irritate the religious tradition-minded among us. The amazing Grace of God isn't a craze or a message. Grace is the Gospel! It is the Good News of Jesus Christ. It's the truth that heralds freedom for the captive, and deliverance to the oppressed and brings eternal life and forgiveness in Christ to those who receive it. In summation, is Hyper-Grace some end-time deception? 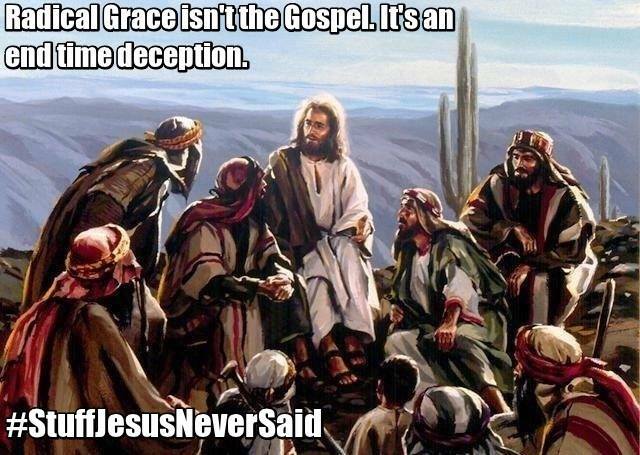 Is Radical Grace some false Gospel message? No. It is the Gospel of Jesus. It is the truth that uproots error and turns over the tables of religion and tradition. Receive it and relinquish religious tradition and find true freedom and peace in Christ Jesus. Grace Q & A: Too Much Grace? We've begun a new series of study getting back to the basics of the Gospel of Grace. We're simply asking questions about Grace and seeing the answers from God's Word. So far we've seen what Grace is. We've addressed the issue of No condemnation. Today, I sense the leading to address a question or rather a concern about Grace. Is there in fact too much emphasis on Grace? Can focusing so much on Grace really be dangerous? Is it really being out of balance to teach so much on God's Grace? If you've listened to Christian radio and podcasts or watched Christian TV, or read any Christian periodicals over the last few years you might think too much Grace is in fact dangerous. Not all ministers and ministries share this sentiment but there are in fact some who seem to be "ringing the alarm" about Grace. To them, this is a major crisis affecting the Church. Let's clarify our terms so as to bring better understanding. I don't like to be misunderstood if I can help it. If a minister or ministry only preaches say one subject and neglects other truths like the Christian model of marriage and family or principles of prayer, or how to have peace in this troubled world or sharing the love of God I would agree that Christians need a balanced diet of truth. That said, we must also realize there are truths of the Word of God that apply to all of these areas. Faith for instance. It takes faith to show love. It takes faith to forgive others. How so? Well God says He loves that individual and has a plan and purpose for them. Faith agrees with God and not any contrary circumstances. What if I fail to do this consistently? Now we see why Grace is also a truth that applies to all areas of our life and relationship with God. So is there really too much Grace? Let's be honest, when tradition raises "alarms" about too much Grace, is it because they are concerned we aren't also teaching enough about prayer, marriage, and family, or walking in love? No, they are concerned because of an "overemphasis" on Grace. Tradition really makes some strange almost contradictory statements when they raise these said "alarms." "I am a big believer in the Grace of God..."
" God's Grace is of course extreme..."
"Yes, certainly, salvation is by Grace, we could never earn our salvation in any way..."
Great, we agree, Grace is over the top, amazing. Oh, wait there is a but coming. "But Grace is just the beginning." "But we shouldn't be extreme about Grace. To say He forgives us of all sins is extreme." "But once we are saved our works show that we are saved. It shows we love God." These paraphrased statements made up of many quotes I've seen over the years from tradition truly reveals just how much tradition misunderstands Grace. But what about the Law and the commands of God? The main issue many bring up is that too much emphasis on Grace deemphasizes the Law, and the many commandments we see throughout the Bible. My question when I hear these concerns is, what portion of the Law is applicable to Christians? Is it the command to not wear mixed garments? To abstain from eating rare steak? Think I am over exaggerating? One of these tradition-minded preachers sounded the "alarm" about Grace by saying, these Grace people believe certain portions of the Bible no longer apply to them. Well, if all of the Bible applies to us, then we best get busy gathering wood to build a tabernacle and collect spotless lambs to begin to sacrifice. Any reasonably minded believer understands portions of Scripture written specifically to Israel don't apply to the Church. Why do tradition-minded make such outlandish comments? Because they haven't fully accepted the Good News. They are still unconvinced our salvation and relationship with God is apart from all effort and is freely given and simply freely received. They feel deeply that there is still something that is required of them to procure it in their life. Compounding this effort rooted and performance-based faith is their reactionary theology. They become aware of a Christians moral failure. They seek to understand why it occurred. They see that the person adhered to the message of the Radical Grace of God. So they figure, that's it. That's why they failed. Of course, it had nothing to do with the enemy tempting them. It had nothing to do with the fact, that this may be an area of particular weakness with that person. Certainly, all other areas where they had matured and began walking in victory is ignored. The focus becomes the message of Grace and nothing else. Tradition reasons then too much Grace is dangerous. What is conspicuously missing, is the fact that Christians had moral failings long before the message of Radical Grace gained such attention. I recall a particular famous minister many years ago who experienced a moral failure. He was a staunch holiness preacher. He preached against everything. What I noted was his teachings and theology was never questioned. The real reason for the charge of too much Grace is because too many are tradition-bound and they still seek to mix Law with Grace. They still seek a place to merge the Old Covenant with the New. They actually stand by this claim that too much Grace can be dangerous. Listen, Grace came through Jesus. How can something that is brought by Jesus be overemphasized? Too much Grace is, in essence, saying we can have too much Jesus. It's utter foolishness from the tradition of men. Tradition views Grace as something that begins our relationship with God. After we are saved, Grace isn't important, it's all about keeping the rules, and submitting to God as the "master". They readily say salvation isn't by works but then preach strongly the need for Christians to get busy working. Salvation then is "God starts it and we finish it." The real reason Grace seems dangerous is that it breaks the controlling yoke of religion off God's people. It opens the eyes of the blind and causes them to question the traditions of men. It changes the dynamics of relating to God from servant to taskmaster to a child and their Father. It forever removes the fear of loss of sonship, fellowship, right standing and the free gift of eternal life in Christ. In summation, we can never have too much Grace. Grace and the Finished Work has application to every single aspect of the Christian life and relationship with Father God. What about the commands and the Law? Tradition likes commands and rules because it doesn't take much faith to live by rules. Grace brings us into truly living by faith. We receive the Savior and He comes to dwell within us. His Spirit leads and guides us, and we know the Spirit would never lead us into immorality. Therefore the only commands we have in the New is to believe in Jesus and walk in the love of God. That is living by Grace through Faith and that leaves no room for the traditions of men and discourages self-efforts, strivings and a performance-based faith. Grace Q & A: Cheap Grace? We've begun a study getting back to the basics of the Good News of God's Grace. So far we've seen what Grace actually is. In our last study, we saw the truth that under Grace there is no more condemnation for the child of God. Today, I sense the leading to address a rather controversial aspect of the Grace of God. There is a concept being used heavily by many churches and ministries. This idea that the Radical Grace of God, this "Hyper-Grace" is really a substitute "cheap Grace". That it's not the real Grace of God. Is this right? Are we proclaiming a knock-off, cheap Grace? To answer, we must define this terminology. What is cheap Grace? 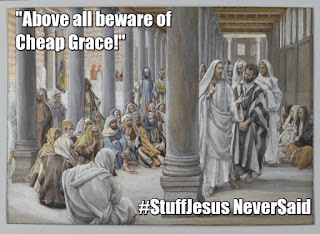 I can look through the Scriptures and can't find the phrase "cheap grace." So where does it originate? Not to disparage a fellow brother in Christ, who was in a sense martyred for taking a public stance against evil, but this phrase was coined by man, not God, a man, a German theologian. This theologian wrote a book on something he called costly grace. He wanted to express that there is a cost to becoming a believer in Christ. If one wasn't paying any price, then is that conversion to Christ sincere? Is this debate new? No, this is the same issue we have today with Lordship Salvation and Free Grace. What's at the heart of the debate? Would you as a Christian, a believer in Christ, a child of God, like to see more commitment from your leaders? Fellow believers? How about in your own life? Costly Grace, Cheap Grace, or Free Grace? Sure, we can all agree as Christians, we desire to honor the Finished Work. Look, the Radical Grace of God isn't a humanistic philosophy that follows the sole commandment "do whatever thou wilt, regardless if it hurts you or harms others." As much as that is true, sometimes I do what I want and sadly I don't care if it harms others or mars my witness at that moment. Now I am not talking about felony criminal activity, obviously. I'm speaking about that jerk in traffic, he deserved me getting angry and yelling at him and throwing all kinds of hand gestures. That slow cashier, it's her fault I am losing my patience, didn't they know I'm in a hurry? The person with me may stumble because I choose to enjoy a drink in public? Hey, I work hard, I deserve a break. See the real world situations I am speaking of? We all have the flesh to contend with, that is that wrong thinking we acquire from living in a fallen world. So how do we address that? Tradition has got a solution. It's costly Grace. It's Lordship Salvation. The German theologian defined this "cheap grace" as a forgiveness without repentance, that is without a complete turning from all sin. It's a grace we give ourselves, as an excuse to pursue sin or stay in sin. It's coming to Christ without commitment. Is this, in fact, cheap grace? When researching this lesson, I came across a wonderfully written article based on another good theologian refuting this idea of cheap grace. They coined the phrase cheap Law and it exploded in my spirit. This is the solution to cheap grace accusations. Tradition wants to eliminate the wrong choices, the wrong thinking which produces wrong actions by supplanting God's free Radical Grace with a more works centered Gospel approach. They mean well, but in exalting performance and commitment, all they have done is cheapened Law to a place where man can keep it and practice it and diluted the Grace of God. 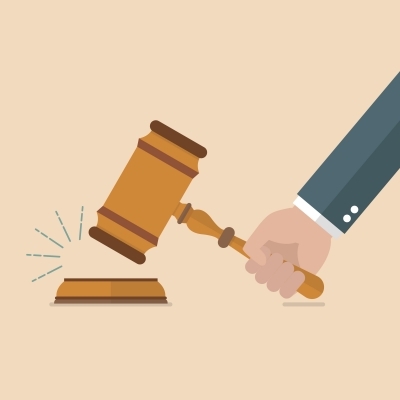 When we supplement effort and personal performance with God's Grace we have cheapened Law. The Law is an impossible standard not designed for us to keep perfectly but to stir up sin and thus reveal to us our glaring shortcomings which then leads us to Christ, the Savior. Supplement: something that completes or enhances something else when added to it. Now armed with this understanding, tell me what can complete or enhance the Grace of God? Does our promise to do better enhance His Grace? Does our obeying perfectly every statute or command we can possibly find complete His Grace in our life? Let's see Paul's definition of "costly grace" and "cheap grace." Paul so masterfully defined Grace and perfectly contrasts works and Grace in Romans 11. If we believe, no matter our motive, that we can supplement Grace with anything Grace no longer becomes Grace, it instantly transforms into works. What is cheap Grace? Grace isn't cheapened when we declare it's free and completely unmerited. Grace is cheapened when we dilute it down to a place where man can enhance or complete it by their works, their commitment, their performance or ability to remain steadfast and faithful. If Grace is anything but unearned, undeserved, unmerited favor and received freely, it is not Grace but works. Grace is cheapened when we shorten its power to totally forgive. When we say Christians are only forgiven up to the point of conversion and from that point, onward, forgiveness is achieved only by personal repentance and confession of sin we are cheapening Grace. Grace forgives us once for all time. We are forever forgiven, past present and future. Grace is cheapened when we declare it can't completely save us. When one proclaims Christians can lose or forfeit their salvation they are proclaiming potential life, not eternal life. They are treating Christianity as a probationary period until we finally persevere until the last day. This cheapens His Grace. Once we are saved, we are eternally saved. In summation, accept no substitute. Only His Grace alone will satisfy. His Grace will lead us to bring forth fruit. His Grace will correct our times of disobedient behavior. After I "flesh out" it isn't long before I hear, "you're better than that." "That's not who you are." "I have so much better for you." Supplements of performance, promises to do better, to be more committed only cheapen Grace and actually dilutes it from leading and guiding us. Why? Because Father God is upset or turned away from us? No, its because we are saying we can complete or perfect what He is doing in our strength and our efforts. In Him, we are accepted. We are loved unconditionally. We have a bright future, and He has great plans for our life. Don't accept tradition's lie that we are promoting a cheap grace when we speak of the Finished Work. Remember they are in reality promoting cheap Law and are deceived into thinking our labor completes what's already be Finished and completed by Christ Jesus, the person of Grace. Grace Q & A: No Condemnation? We've begun a new study, getting back to the basics of the Gospel of the Grace of God. Answering the basic questions that arise concerning the Radical Grace Gospel. Even though you may have heard these things before, it is good to go back to the truths that first set you free from tradition and unlatched the shackles of religion that kept you bound. Just how good is this Good News? Just what is this Gospel of Grace? Is Grace a license to sin? Does Grace equal once saved always saved? Does Grace do away with the Law? Does Grace mean we never do anything? What about works? Let's take our time and revisit the basics and strengthen our understanding of Jesus and His Amazing over the top Grace. Today, I sensed the leading to answer the basic question, what is condemnation? As believers can we really expect to never be condemned again? No matter what? Condemnation arises against us in many forms. The most obvious is when we miss it or blow it. When we give in to temptation, the enemy, the very one enticing us to blow it, immediately rushes in bringing words of condemnation accusing us. "You call yourself a Christian?" "Brother or sister so and so would never mess up like you did!" More often condemnation comes from the lies we have believed from religion. Sometimes the enemy sits backs and through religion allows us to simply condemn ourselves. How do we do this? It's very subtle. Often we find ourselves comparing our lives to this person or that person. "They are prettier than me." "That person is in better shape than me." "Their house is much nicer than mine." "They must be more spiritual than me, their Bible is way more highlighted than mine." "The Sunday School teacher called on them and not me to answer. They must know I haven't been as spiritual as should be as of late." The list can go on endlessly. When we compare ourselves to others we will only focus on our shortcomings and receive condemning thoughts about ourselves. 2. Not following the rituals and regulations and rules of our religious sect, church or denomination. Depending on the group you may follow, you may find that you break the rules so to speak. Some groups frown on women wearing makeup or even wearing a red dress. With all the rules of religion, it is easy to see how we can condemn ourselves for not lining up perfectly with all the rules. I am not even referring to committing actual sins. I am speaking of people breaking the rules of their denomination and such. For example, your church group may think it's sinful to own a TV. So when you visit a relative for the holidays who isn't a part of this group who owns a TV, you feel guilty because you were around a TV. We may laugh it off, but sadly, this type of condemnation is all too real for some Christians. To those in strict religious groups, they really feel they are letting God down. If they let their commitment to the rules slip they can be overwhelmed by thoughts of condemnation. 3. Having a performance and self-effort rooted faith. This is not the same as following a list of demands given by a religious church. This is self-inflicted rules we sometimes convince ourselves that God requires of us. How does this manifest? Wrong thinking like attributing our goodness or faithfulness as the root of God's goodness or blessing in our life. God blesses us because He is good not because we are. As another example, many still think under this New Covenant, it's our tithing or giving that opens the windows of Heaven, not realizing it's the Blood of Jesus and the Finished Work that brought us a perpetual open Heaven and free access to our Father's presence. What is the answer to condemnation? What about all these areas of condemnation? Does Grace really cover all of them? Is there really no more condemnation? Hear God's Word on this issue. No condemnation? Is it really true? The answer is clear in Scripture. God said it and it is settled. No more condemnation. Even if I blow it too much? There is no clause. In Christ, there is no more condemnation. Do you belong to God? Have you received the free gift of righteousness and eternal life? Then no longer is there any condemnation towards you ever again. In Christ, you are condemnation free for all eternity. In Christ, we must receive of this free gift of righteousness. Don't just receive this Grace and perfect right standing before God. Open the gift. Take that gift of no condemnation and reign victorious over the lies of the accusing enemy of religion, tradition, performance-based faith and the religious regulations of man. No longer can the accusative words of condemnation affect our walk in Christ. Receive the abundance of Grace. Even when you blow it, remember there is no condemnation in Christ. No longer compare yourself to others, receive the truth of what God your Father says about you. You are unique and highly valued to Him. Follow the leading and guiding of His Spirit and relinquish the regulations of man. Rest in His Finished Work and not your performance. When you receive of the gift of righteousness and His abundant Grace condemnation falls by the wayside and it is easier and easier to clearly recognize it for the lie that it is.